whole country. Thus, China claimed on December 16th, 2009 that they will increase the number of power plants to support 5% of China’s electricity. This plan has been underway since 2009 creating five nuclear power plants annually to provide 400 million kilowatts to China. Then, why is China planning to create so many nuclear power plants? First of all, it is to save money used in purchasing coal, the number one resource China uses. According to a statistic done by the government, in 2013, China alone has used 21.3% of the world’s energy source. The important part is that 60% of them are energy created by burning coals. Coal is known to be one of the most used energy resource around the world, thus the reserves have been reducing for quite some time now. However, as China uses around 3.4 billion tons annually to get their industry going, they needed a new method of producing electricity. For this reason, they are creating nuclear power plants which can create electricity with a rather low charge of money. Another reason is to reduce the heavy air pollution caused by burning coals. China is well known for its heavy smog through burning coals at fire plants which disturb the environment. To add on, as coals are well known culprit of causing the global warming, the Chinese government are doing their best in reducing the use of coal. Therefore, they started investing in alternative methods such as nuclear power plants to create energy. ▲ This map of East Asia shows how China and Japan are constructing nuclear power plants, covering their entire nation. This phenomenon is seen as a huge potential threat to Korea. Although there seems to be no issue in increasing the number of nuclear power plants to replace the environment criminal coal, there are few problems that are yet unseen. To start off, the location of the nuclear power plants in China is the primary issue. The power plants are all located coastal and inland surrounding the East South coast zone, one of the fastest rising economy centers of eastern China. To add on, the Chinese nuclear power plants are being constructed to the northeastern coastal areas of China. Thus, it seems as if nuclear power plants are surrounding the two Koreas, threatening both. This is troublesome since if a natural catastrophe hits these places, a radioactive leak from the power plants are blown to Korea as well as Japan. One thing to point out is that this is not just a theory or a prediction as China has had over 800 earthquakes that measured over 6.0 since the 1900s. Apart from this, one of the most criticized actions China has done is planning to create four nuclear power plants in Jilin province, located nearby the Baekdu Mountain. As this mountain has been active since 2002 after a 7.3 sized earthquake shook its temporary dormant state, there is no safety for a nuclear breakdown. Other issues include lack of security and safety laws for nuclear power plant in China. According to China Dialogue, China has only permitted constructing nuclear power plants and did not provide any educational support to the workers. The workers are only taught how to react in certain situations. Moreover, the power plants that were made and are being made have not been tested of itsdurability against natural disasters. In addition to this, there is a slight problem with the Chinese community as there are no civic organizations to request the government for a change. This causes much of a problem since, it means that the government could hide some information that could be dangerous. For instance, in 2010, the leak of cooling water in Guangdong led to a radioactive leak which the government hid until a news flash went over the country. Such problems could lead to bigger issues in China as well as those that affect the nearby countries as well. When seeing that Korea is nearest to Chinese nuclear power plants and the fact that the wind blows west, Korea would take the most damage. If the Chinese nuclear power plants leak radioactive wastes into the Yellow Sea, there are several problems it will cause to Korea. For the starters, the economy of Korea will drastically be damaged. Currently, the eastern Asia has 31% of the world’s population, records 20% of the world’s GDP and 22% of the world’s trade. This makes the western part of Korea an area with potential global competitiveness. Nevertheless, if radioactive wastes contaminate the sea, there is no chance but to lose that competitiveness. Moreover, according to a report made by Koo Bon-kwan, a senior researcher at the Samsung economic research institute mentions that Japan has faced so much economic trouble after the mega tsunami hit their country. The roads were destroyed completely, the Japanese Yen lost its international power by 20% and due to recovery, the Japanese government faced shortage of government funds. These exact same problems will occur in Korea if China gets hit. When measuring the 30 points stock market drop after the earthquake hit Japan, a nearby country, it slightly shows how bad the market will drop when Korea is affected directly. 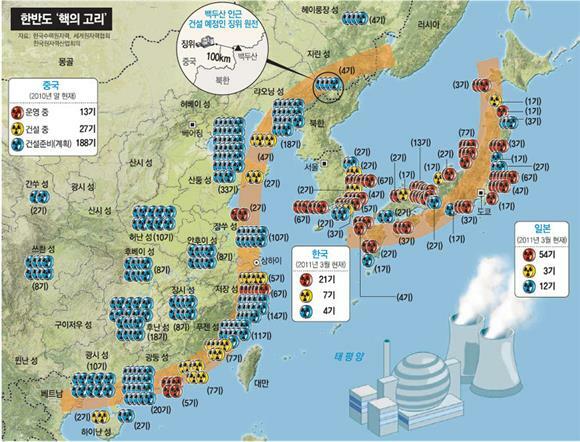 Apart from this, Korea will face social problems when covered with radiation that blows from China due to the westerly. Thousands of people will have direct contact to the radiation which could lead to a possible revolt from the citizens. People will raise their voices due to fear from being exposed to radiation. Thus, the reliability to the government will be lost like Japan, where people refuse to eat food brought from Fukushima, the origin of the accident, which the government claims to be ok. Also, when seen from the international scale, the social issue of being exposed to radiation can possibly create diplomatic friction between one country to another. However, according to the IAEA, the International Atomic Energy Agency, there is no rule specified to prevent countries from building nuclear power plants in their own country. Thus, it seems that the diplomatic friction will not be effective enough to make countries stop running their power plants. One of the worried issues the radiation from China will cause is the effect to the environment in the Korean peninsula. According to Kang Yong-mook, a professor of the Department of Energy and Material Engineering in Dongguk University claims that every being from human to environment will face critical changes as they will have their genetics modified. Trees will lose their ability to reproduce, leading to limited amount of oxygen created, the ecosystem will collapse bringing severe changes to the environment of the animals. Also, according to the professor, for the radiation to lose its effect by half, it takes over 100 years. Therefore, in his own opinion, he believes Korea will exist no more, if China loses grip of the nuclear power plants. To wrap up, most of the Koreans are worried about the Japanese radiation. Japan is continually creating environmental and social issues to the world. However, we need to be aware that China is the biggest possible problem Korea can face. Although many are facing to the east to predict further indirect damages to Korea, it is time for people to face to the west, the potential bomb that threatens our future.